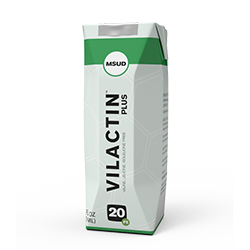 Vilactin AA Plus is a valine, isoleucine, and leucine-free,nutritionally complete, ready-to-drink, amino acid based medical food for the dietary management of Maple Syrup Urine Disease. Vilactin AA Plus has a creamy, non-acid taste profile in an all-natural Berry flavor. Suitable for ages 1 through adult. For the dietary management of Maple Syrup Urine Disease (MSUD). Dispensed by prescription. Vilactin AA Plus is a ready-to-drink metabolic formula product for Maple Syrup Urine Disease patients, 1 year and older. Use as directed by physician. Must be administered under medical supervision only. Water, amino acid blend (L-glutamine, L-alanine, L-lysine HCl, L-phenylalanine, L-tyrosine, L-threonine, L-histidine, L-proline, asparagine, L-tryptophan, L-arginine, L-serine, L-glutamic acid, glycine, L-cystine, L-methionine, taurine, L-carnitine), vitamins and minerals (calcium lactate, monosodium phosphate, monopotassium phosphate, choline bitartrate, magnesium amino acid chelate, sodium ascorbate, ascorbic acid, dl-alpha-tocopheryl acetate, iron amino acid chelate, niacinamide, zinc amino acid chelate, calcium d-pantothenate, manganese sulfate, riboflavin, B6 Pyridoxal Phosphate, thiamin HCl, copper gluconate, L-methylfolate, vitamin A palmitate, potassium iodide, sodium selenite, cholecalciferol, K1 phytonadione, K2 MK-7, sodium molybdate, cholecalciferol, chromium chloride, biotin, B12 methylcobalamin), canola oil, sugar, natural flavors (propylene glycol, water, potassium sorbate), inulin, cellulose gel and carboxymethylcellulose sodium, food starch modified, sodium hexametaphosphate, DHA algal oil, acesulfame potassium, carrageenan, sucralose. Contains corn and soy.